Microsoft Mathematics 4.0 is now available as a no charge download. This new version of Maths is a serious upgrade to version 3.0, so if you haven’t already done so, download a copy now. 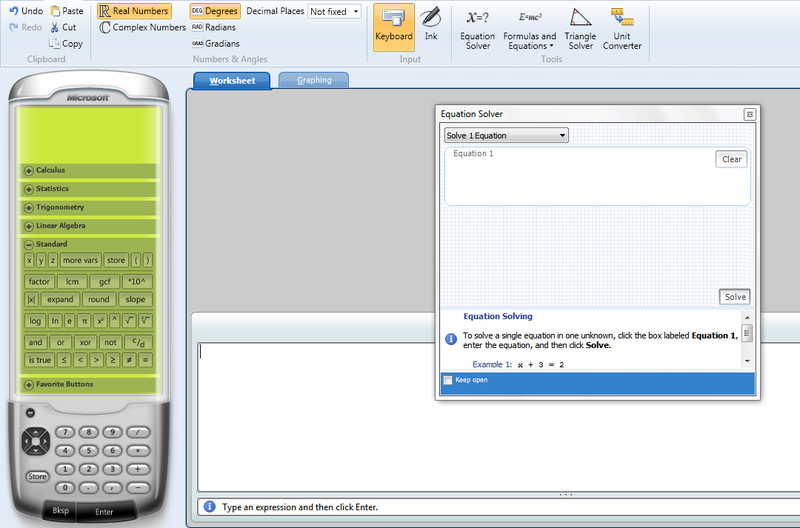 Math 4.0 is designed to offer users a graphing calculator capable of plotting both in 2D and 3D, but also offering equation solving capabilities along with step-by-step instructions of the process. There is a fantastic unit converter, and I like the triangle solver for it’s simplicity and ease of use. The calculator is just like a normal hand held, but a lot more powerful. The tutorials and interventions are really powerful. In addition, Microsoft Mathematics 4.0 comes packed with a range of additional tools that are bound to come in handy to students dealing with math and science studies. It’s also really useful for parents who want to be able to assist their children with Mathematics. It’s like a personal tutor on your PC. Students can learn to solve equations step-by-step while gaining a better understanding of fundamental concepts in pre-algebra, algebra, trigonometry, physics, chemistry, and calculus. It only takes a minute, and it’s no charge to download. Download your copy now.